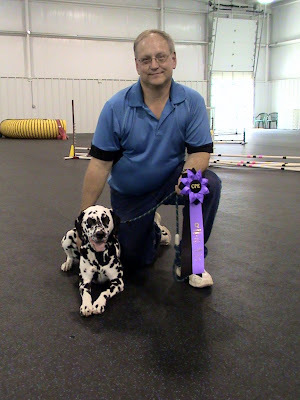 In May of this year, a good friend of mine and fellow Dalmatian owner was diagnosed with breast cancer. She was the second Dal friend who received this devastating diagnosis in the past year. I struggled with a way that I could support my friend through her diagnosis and treatment, and I teamed up with a graphic artist and a printer to design and sell t-shirts to raise money for breast cancer research and awareness, in honor of my friends. As a result of our efforts, I formed a non-profit called "Spot a Cure." Pictured below are the two t-shirt designs that we developed. Design #1 is called "No Obstacle Too Big to Conquer" and is printed large on the back of a white t-shirt with Design #2 printed smaller on the front left chest of the shirt. 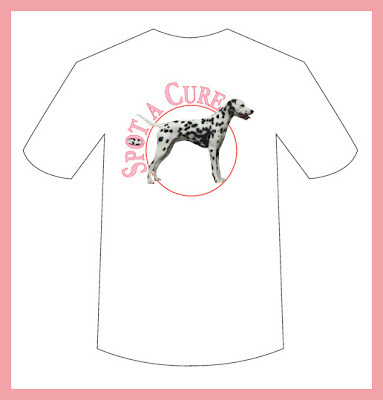 Design #2 is called "Spot a Cure" and is also printed large on the back of the t-shirt with Design #1 printed smaller on the left front chest of the shirt. If you look closely, you may see a Dal you know! 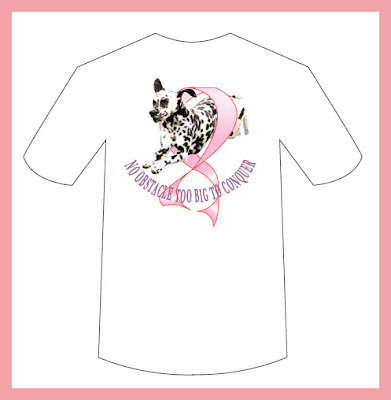 Tess was the model for the "No Obstacle Too Big to Conquer" shirt, and Jazz's handsome half-brother Gage was the model for the "Spot a Cure" design. Each of these shirts is available in adult sizes S, M, L, XL, and 2XL for $15, plus $5 to defray expenses of shipping and handling. Nearly $10 from each shirt will be donated to breast cancer research/awareness. The shirts are digitally printed in full color, front and back. They are available for purchase on our website at http://www.spotacure.com/, where you can securely order online through PayPal. One in seven women will be diagnosed with breast cancer in their lifetime. The woman you help by supporting Spot a Cure may be you or someone you love! Please pass this information along to any of your friends or family who may be interested in purchasing one of our t-shirts. With each shirt purchased, we're including a laminated shower card with instructions for performing a breast self-examination. Both of my friends detected their tumors through this important test only months after having clear mammograms. Help us "Spot a Cure" for breast cancer by ordering one of these great t-shirts today! Jazz ran in CPE agility again this past weekend and earned her Level 1 Strategy Games title with a first place Q in Snooker, which also completed her overall Level 1 title. She also qualified in Level 2 Full House. Our next few trials will be in AKC and USDAA with Tess, so Jazz will keep training until the end of October, when we'll try another CPE trial. Jazz and I are also working hard on Rally and will make our Rally Advanced debut in September. 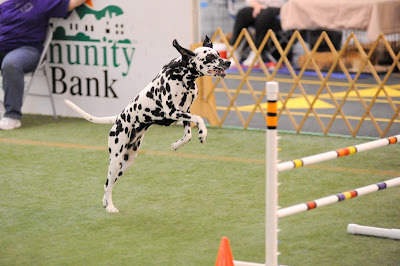 Also at CPE, Tess qualified in her first Championship level run with a second place in Wildcard. Go, Tess, go!! After several near misses, including being just 1 point away, Jim and Tess earned a Perfect Weekend ribbon at CPE agility!! That means that they qualified in all eight of their runs over this past weekend, all of which were in Level 4 and 5, which are the higher levels of competition. Tess also got her Standard Level 4 and Fun Games Level 4 titles. Jim and Tess have become a great team, and we're so very proud of them! Jim, Tess, and the rest of the gang who earned Perfect Weekend ribbons at the CPE trial at K9 Athlete Center in Washingtonville, OH, along with judge Art Malott from Ontario, Canada, eh! Tess wasn't the only star this weekend. 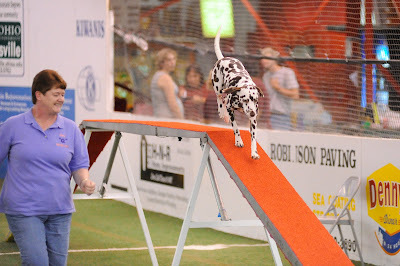 In only Jazz's second CPE trial, she qualified and placed in five out of six runs, earning her Standard Level 1, Handler Games Level 1, and Fun Games Level 1 titles! Jazz had a lot of fun on her runs and is gaining confidence in us as a team. I was thrilled with how well she ran for me this weekend and look forward to our next runs together!